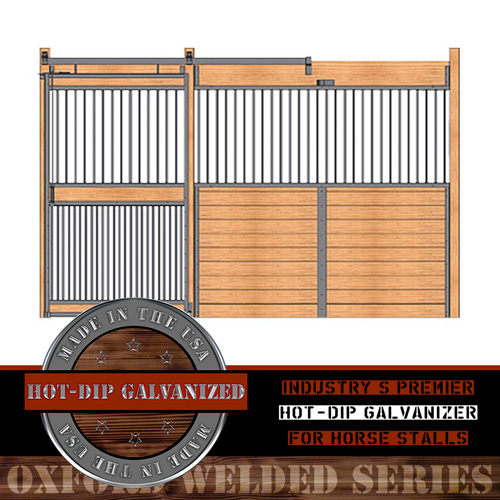 Keep an eye on everything with our Oxford welded horse stall front with full grill door kit. This front allows a great amount of light and air into your horse stalls while still containing them. Keep an eye on everything in your stall with the Oxford welded horse stall front with full grill door kit. This front allows a great amount of light and air into your horse stalls while still containing them. These doors are great for horse stalls, tack rooms, equipment rooms or hay rooms. Our Oxford welded horse stalls are constructed of hot-dip galvanized steel (14-gauge frame), feature hidden interior welds, and offer the best type of rust protection available! RAMM is the industry's premier hot-dip galvanizer for horse stalls.